Lily Bell: Worthy of Love is timeless fable written for children yet touches the heart of all ages, especially those with special needs who long to be included. It is a story of a frail yet determined dove named Lily Bell who is unable to fly. With the help of her family and some unlikely friends, she journeys through the forest to finally find what she has been searching for: her purpose and worth. Lily Bell realizes that she can do all of the things with her friends, just in a different way. The moral of the story is we are all wonderfully made with a unique purpose and plan for our lives. Through our brokenness or "imperfections," we are able to help others. 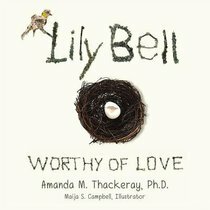 With the "perfect" self-image being projected on to today's generation, the story of Lily Bell: Worthy of Love is a heart-warming, uplifting, and relevant change that delivers a strong message of acceptance, friendship, and courage in a way that children will understand and adults will appreciate: we are all worthy of love. About "Lily Bell: Worthy of Love"